And at the same time, 28 private investors, including Microsoft&apos;s Bill Gates, Facebook&apos;s Mark Zuckerberg and Amazon&apos;s Jeff Bezos, pledged their own money to help build private businesses based on that public research. 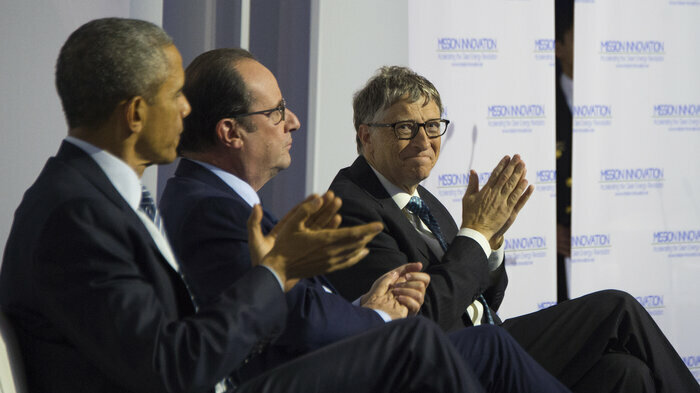 The 20 governments and the investors are calling their joint effort "Mission Innovation." They say they must act together because "the pace of innovation and the scale of transformation and dissemination remain significantly short of what is needed." The announcement came at the start of the 12-day climate-change talks in Paris, where representatives from nearly 200 countries are meeting. Mission Innovation&apos;s goal is to boost the collective annual spending on energy research to $20 billion, up from $10 billion. But do public-private collaborations really work? Early innovators in energy were pretty much lone rangers and wildcatters. For example, when John D. Rockefeller started the Standard Oil Co., he relied on his brother and some business partners, not a coalition of governments. In the energy sector, "the argument for government funding is not very good," said Benjamin Zycher, a resident scholar who studies energy policy at the American Enterprise Institute, a conservative research group. No matter what taxpayers spend, finding realistic, reliable replacements for proven energy sources is "very unlikely," so the expenditures may not pan out, he said. But the investors who back Mission Innovation say government support for basic research will allow them to invest wisely through their newly created group called the Breakthrough Energy Coalition. Many of the billionaire backers made their private fortunes from the Internet, which was created with government funding. Their coalition promises to "invest early, invest broadly, invest boldly, invest wisely and invest together," according to a statement. It says the "poorest parts of the world require an aggressive global program for zero-emission energy innovation." But why mix together public and private efforts? If an energy alternative idea looks promising, shouldn&apos;t the private sector just invest in it anyway? Supporters say that with the existing energy infrastructure — think pipelines and gas pumps and coal mines — it&apos;s very hard for new energy sources to grow up. That&apos;s especially true now that oil, natural gas and coal are selling at the lowest prices in years. When it comes to investing in alternatives, "there&apos;s no fortune to be made," Gates told The Atlantic in a recent interview. "For energy as a whole, the incentive to invest is quite limited, because unlike digital products—where you get very rapid adoption and so, within the period that your trade secret stays secret or your patent gives you a 20-year exclusive, you can reap incredible returns—almost everything that&apos;s been invented in energy was invented more than 20 years before it got scaled usage," Gates told the magazine. In other words, developing new sources of energy requires very patient money. So Gates and his fellow billionaires will offer early-stage capital for technologies with long-term potential to generate clean energy. In a statement released Monday, Gates did not say specifically how much the investors would spend collectively, but he said he is "optimistic that we can invent the tools we need" to fight climate change. Collectively, the 28 private participants are worth an estimated $350 billion. Despite their own comfortable lives, "these are investors who care about clean energy and cheap energy," Gates said. The White House, in a statement, praised the Gates-led group and said the United States would "seek to double its current level of investment in clean energy research," which now is about $5 billion. But that doubling may not come easily, given that Congress is controlled by Republicans, whose party does not accept mainstream climate-change science. In an essay Monday, Sen. Jim Inhofe, R-Okla., who chairs the Environment and Public Works Committee, said President Obama "has no way to follow through on any of his promises" regarding climate change efforts. The 20 countries participating in Mission Innovation are: Australia, Brazil, Britain, Canada, Chile, China, Denmark, France, Germany, India, Indonesia, Italy, Japan, Mexico, Norway, South Korea, Saudi Arabia, Sweden, the United Arab Emirates, and the United States.